Last month, the Life Sciences Summer Institute (LSSI) wrapped up its 10th summer of providing high school students biotechnology laboratory training and placing them in summer research internships. It also concluded its sixth summer connecting youth to Science, Technology, Engineering, and Math (STEM) careers through the Introductory Life Sciences Experience (ILSE). On Aug. 14, in front of their peers, mentors, faculty staff, donors and family members, 42 LSSI students presented their summer work, reflecting on their contributions to the lab, their personal experience and their summer projects. Students selected to take part in LSSI worked alongside research scientists at world-renowned research institutes, including long-time partners Salk Institute, The Scripps Research Institute, and the University of California, San Diego. During the course of their LSSI experience, students worked in various labs, including molecular biology, chemistry, stem, plant, computational biology and more. As such, presentations focused on topics such as increasing transformation efficiency of human pluripotent stem cells, studying human immune response through humanized mouse model, and synthesis and recrystallization of manganese (III) catalyst for HAT hydrogenation. 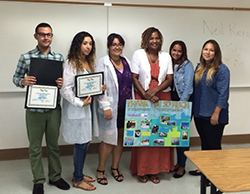 Upon completion of the LSSI internship program and delivery of their final presentations, students earned UCSD Extension college prep units. Additionally, on Aug. 15, eight ILSE participants gave their final presentations, which reflected on what they learned in the program, how it impacted their future career choices, and their goals for the next five years. Through ILSE, students took part in hands-on laboratory training at the Southern California Biotechnology Center at San Diego Miramar College, as well as STEM industry visits to the Ocean Discovery Institute, Navy Hospital, USS Lawrence, The Scripps Research Institute, and Living Coast Discovery Center. To date, the LSSI program has trained more than 400 students, including training for 79 students through ILSE. For more information on the program and funding opportunities, please contact Erika Arangure at erika@workforce.org.